Squirrel Girl Celebrates the Holidays « Adafruit Industries – Makers, hackers, artists, designers and engineers! What would Squirrel Girl (Doreen) and Tippy Toe do to celebrate the holidays? They’d obviously dress up for the occasion and give each other presents. Cosplayer Galacticat, also known as Megan, imagined what their gift exchange would be like with a sweet Christmas-themed photo shoot. She first made the holiday spin on Squirrel Girl last year and used a cover from the Great Lakes Avengers and an outfit from the Marvel Heroes game for inspiration. This year she pulled the outfit back together for pictures with Tippy Toe — these are much cooler than any of my family portraits taken during the holidays. When Megan made the regular variation of the Squirrel Girl costume for Dragon Con, she said constructing the tail was the hardest part. It was originally attached with a loop to a harness through the top, and velcro and snaps on the bottom, which resulted in the tail coming unattached every time I moved. Both attachments were replaced with clips removed from pager holders, which slip into pockets sewn onto the tail (see photo in album). I updated the harness for DragonCon, to make it more comfortable and less lumpy. 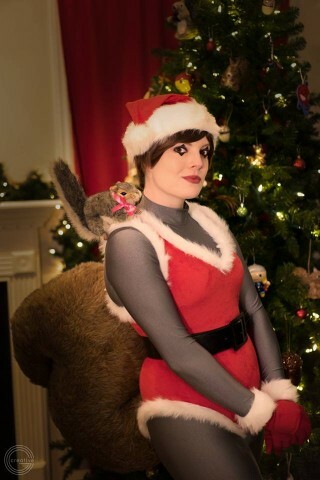 Check out more Squirrel Girl Christmas photos at Facebook.